50 • SPONSORED CONTENT • SEPTEMBER 2017 CONVENIENCE STORE FOODSERVICE TODAY Is fresh food becoming more popular in c-stores these days? Danielle Miller: It is. The "con- venience" aspect of c-stores is extremely appealing to today's busy consumer. C-stores are in a perfect position to lever- age this attribute and become more of a destination when they add fresh foods. In a 2015 Technomic study, titled "Convenience Store Foodservice: Outlook and Opportunities," over one-quarter of the c-stores surveyed intend to upgrade their foodservice equipment and another 20 percent plan to upgrade their merchandising and display of fresh food in order to increase sales. Consumers are doing more "on-the-go" eating and they prioritize fresh food and beverage selection as important reasons for visiting a c-store over other food venues. Are grab 'n' go items are also a part of that new emphasis on fresh food? DM: C-store operators rely heav- ily on grab 'n' go equipment for key reasons. It speeds traffic flow, allowing the operator to be "convenient" for the consumer, which is the mainstay position of a c-store. It provides a safe refrigerated display for premade packaged foods that saves labor over onsite make-to-order food items. It allows the operator to offer fresh foods and beverages in the same display to potentially turn a beverage-only occasion into a beverage-food occasion, increasing the average spend at checkout. With this new emphasis on fresh food, is presentation even more important to c-stores now? DM: Presentation is critical. Food display equipment should disappear so that all the cus- tomer sees is the fresh food. Consumers buy based on per- ception. What they see, smell and feel impacts how fresh and appealing the food is to them. When it comes to food display "equipment," it's what you don't see that makes the difference. How can Structural Concepts help c-store operators capital- ize on the growing demand for fresh food? 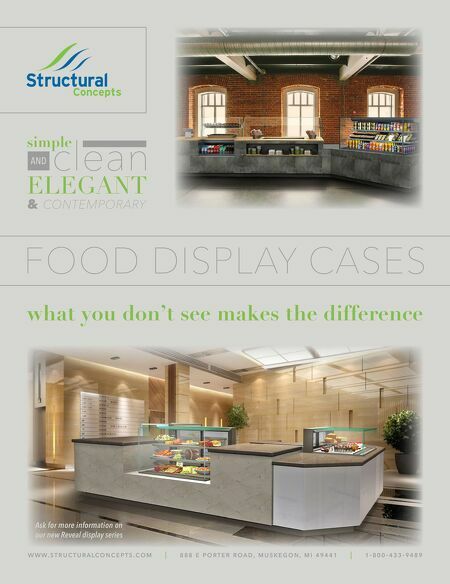 DM: Structural Concepts special- izes in creating eye-catching fresh food presentations with excep- tional, no-worry refrigeration. Displaying fresh food requires a refrigerated display that safely holds the required product tem- perature. Refrigeration technol- ogy like Structural Concept's Breeze-E self-contained refrigera- tion system ensures reliable refrig- eration performance in the higher ambient conditions associated with c-stores. A larger compres- sor, smart controller, oversized condenser coil and specialized air flow design work together perfectly to ensure refrigeration reliability and safe product temperatures 24/7. Breeze-E is part of nearly every one of our grab 'n' go models. Talk about some configuration options available from Structural Concepts for c-store operators. DM: Low-profile grab 'n' go island and endcap displays are extremely popular for c-stores. The lower height of these models doesn't restrict sight lines across the store and the smaller footprints fit nicely in all store formats. Another popular configuration is to incorporate a grab 'n' go display under the POS counter or serving counter area. This turns an area typically used for storage into a revenue generating display. With an increase in fresh make-to-order food in some c-store formats, a combination preparation/ grab 'n' go display often makes sense. These models provide full view of the preparation process and provide an area in front for customer self-selection of pre-made or complimentary food products. 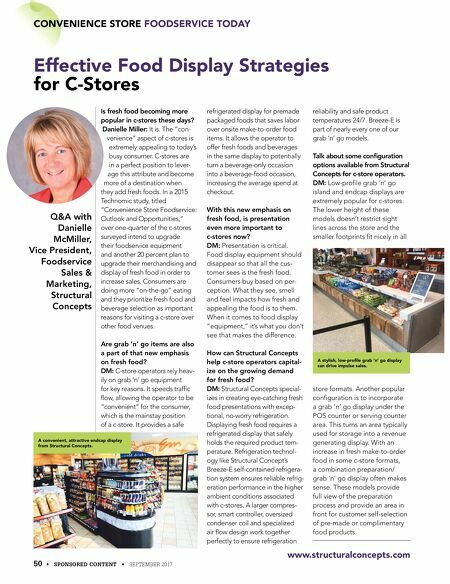 Effective Food Display Strategies for C-Stores Q&A with Danielle McMiller, Vice President, Foodservice Sales & Marketing, Structural Concepts www.structuralconcepts.com A stylish, low-profile grab 'n' go display can drive impulse sales. A convenient, attractive endcap display from Structural Concepts.